So remember when I doing the food combos and Doctor Oz said dark chocolate and apple and I was like, what! Well, that was stupid of me. 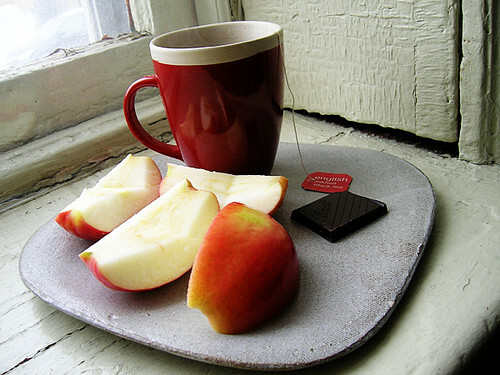 Dark chocolate and apple is amazing, you just have to know how. So okay, the key is the order you eat these in: first, sip of tea to warm your mouth. The first sip is not the most important, but it becomes important in the second round. Next, bite of chocolate that melts in your mouth. Then, bite of apple with the taste of chocolate still in your mouth. Okay now second round, sip of tea. Which warms your mouth after the cold fruit. And so on. See if you eat the chocolate after the fruit, it turns waxy because your mouth is cold.